These Terms of Service governs our relationship with users and others who interact with Let's Create! 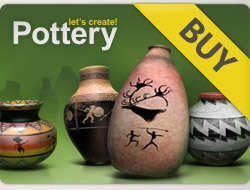 Pottery Community Portal. These Terms of Service govern your access to and use of the services provided by this website (the “Services”), and any information, text, graphics, or other materials uploaded, downloaded or appearing on the Services (collectively referred to as “Content”). Your access to and use of the Services is conditioned on your acceptance of and compliance with these Terms. By using or accessing Let's Create! Pottery Community Portal ("this Portal"), you agree to these Terms of Service. PLEASE NOTE: Only English can be used while posting any text content on the portal. You will not send or otherwise post unauthorized commercial communications (such as spam) on this Portal. You will not collect users' content or information, or otherwise access this Portal, using automated means (such as harvesting bots, robots, spiders, or scrapers) without our permission. You will not offer any contest, giveaway, or sweepstakes ("promotion") on this Portal. You will not use this Portal to do anything unlawful, misleading, malicious, or discriminatory. You will not do anything that could disable, overburden, or impair the proper working of this Portal, such as a denial of service attack. You will not use Facebook if you are under 13. You can however use this Portal. All right, title, and interest in and to the Services (including Content provided by users) are and will remain the exclusive property of Infinte Dreams Inc. and its licensors. The Services are protected by copyright, trademark, and other laws of both the United States and foreign countries. Nothing in the Terms gives you a right to use the Portal's name or any of the Portal's/Infinite Dreams Inc trademarks, logos, domain names, and other distinctive brand features. Any feedback, comments, or suggestions you may provide regarding this Portal, or the Services is entirely voluntary and we will be free to use such feedback, comments or suggestions as we see fit and without any obligation to you.